Herrera (hamstring) is slated to take some at-bats Wednesday in a minor-league game, Matt Breen of The Philadelphia Inquirer reports. The report doesn't reveal if Herrera will run the bases or play the outfield, activities that would provide a better indication of how the 27-year-old is coming along in his recovery from the left hamstring strain that has sidelined him for most of camp. In any case, Herrera's ability to face live pitching is a step in the right direction and suggests his return to the Grapefruit League lineup could be imminent. 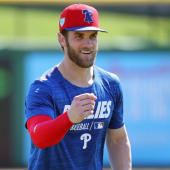 Assuming he's close to full strength by Opening Day, Herrera is likely to serve as the Phillies' primary center fielder.